to see who will survive the girl who HATES FAIRYLAND. worked with Skottie Young for over ten years. Dark Horse and many more." "A candy-colored and vicious delight and always dangerously funny." -Neil Gaiman NPR - "Now both Princess Syndrome parents and skeptics can find common ground. 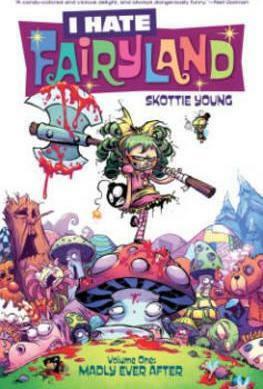 'I Hate Fairyland' makes it so much fun to rag on all things fluffy and lovely, it doesn't matter whether you're concerned about your daughter's development or afraid for your friends' and neighbors' sanity."